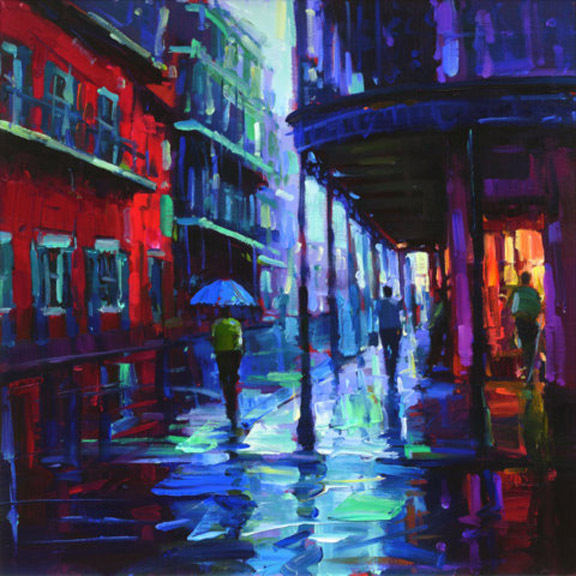 Micheel Flohr paints a glimpse of a rainy day on the streets of New Orleans' French Quarter. He takes the viewer to a corner on "Bourbon Street" where he captures a moment in time where colors seem to merge in the sky bursting through the clouds into rain. At the center, a lone figure braves the rain and the slippery Cobblestone Streets. Soothing shades of blue, red and yellow reverberate like an alto sax playing in the distance creating a sense of quietude and reflex a much simpler time gone by. Flohr captures the buzz of the street. The rain falls against the pavement like twinkling piano keys and the wispy snare drum cadence of footsteps coalesce as the figures head to their destinations. A symphony of art, music and life comes alive.